10 Motivation Tips To Boost Your Daily Life - Motivate Amaze Be GREAT: The Motivation and Inspiration for Self-Improvement you need! 1. 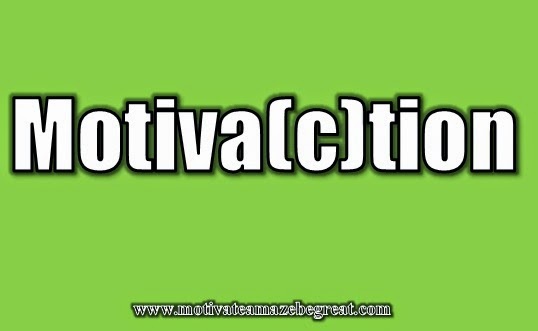 Motivation comes from motives. What are your motives? Find them out and the power "to do something about it" will come. What are your whys for doing it? Find out strong whys like your family, your friends, your future, long therm accomplishments, leaving a legacy, whatever really matters. Be honest with yourself. 2. Keep a journal. Keep track of what you doing by writing it down. Look at what you wrote daily, weekly, monthly. This will make you proud of what you are doing and the progress you're making. It will drive you to do more and more. 3. List your goals, leave them where you can see them daily. Those are your destinations, each day you take the road towards them, so each day, remind yourself where are you going before hitting the road. 4. Whenever a difficulty comes at you look at as an opportunity to get better. Accept the challenge, its a chance to do something never done or something that will challenge you in new ways that will make you improve your skills. 5. Are you doing it just for you? Do it for somebody else also, this will boost your drive to do it. When it's just about us we tend to leave the task at hand with a soft "I'll do it latter". But when it's for somebody else you cannot postpone things like that. 6. Ask yourself this question throughout the day : What's my priority right now? Whenever that answer doesn't satisfy you, change what you are doing into a real priority. 7. Talking about it will get you excited, doing it for real will get you motivated to do more. So instead of talking about, do something about it. Execution is key to stay on point. Do it and do it. Leave the talking part for later. 8. Make time for your motivation hour daily. For 1 hour read great quotes, listen to motivational speakers, watch inspiring videos, listen to powerful music, write on your journal, whatever fits for you. Keep on track. 9. Be an active person. The right fuel for the body. Exercise your body and develop and healthy lifestyle. Your body's biochemical will change and your will to do things also. 10. Top your yesterday by being better today. Analyze what you did yesterday, do it better and wiser today. Make this comparison every day and you will find ways that motivate you to get better. You against yourself is one of the best motivations around.